Back in the day, during the holiday season you were limited to only a few classics that truly captured the holiday spirit. Watching "Babes in Toyland" (1935) and "It's a Wonderful Life" (1947) never seemed to get old, which was a good thing, because you wound up watching them at every holiday gathering. You turned it on and had it playing while you entertained and that helped to set the holiday mood. People no doubt still do that to this day, and that's all right. Now, of course, things have changed. You have your pick of literally dozens of films that are expressly crafted around the holiday. 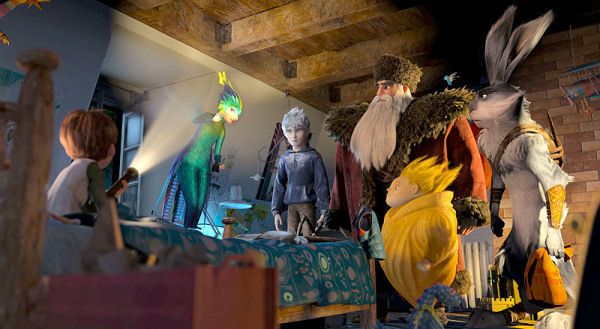 "Rise of the Guardians" (2012), a DreamWorks Animation picture directed by first-time feature filmmaker Peter Ramsey, is a welcome addition to that growing list. An adaptation of children's author William Joyce's "The Guardians of Childhood," it works by combining the magical and the human in vivid colors. While it rather notoriously under-performed at the box office, that does not make it a bad film - though its eccentric take on traditional holiday characters may be (and apparently was) off-putting for many viewers. An evil spirit, Pitch Black aka The Boogeyman (Jude Law), wants to rule the children of the world. He is opposed by The Guardians, who protect their hopes, beliefs and innocence. The Guardians are immortal, mythical (apparently) beings who have been chosen by the Man in the Moon. 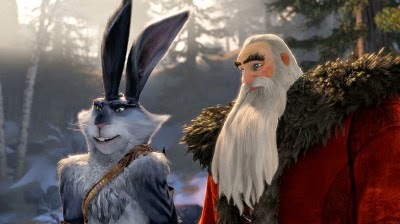 We meet: Bunny (Hugh Jackman), who looks a bit like a kangaroo, is very tall and a bit off-putting, and talks with an Australian accent; Tooth Fairy (Isla Fisher), who buzzes around as a part human, part hummingbird with a positive attitude; Santa aka Nicholas St. North (Alec Baldwin), who is a muscular man with a Russian accent who doesn't play around; Sandman, who doesn't speak but communicates just fine anyway; and Jack Frost (Chris Pine), who can turn anything he touches into snow. Jack turns out to be our hero. He is a new addition to the Guardians, having just received his magical powers and become immortal. All his life, he has been a bit of a miscreant, wanting to be better known than he is. This story details how he matures and fulfills his true destiny. 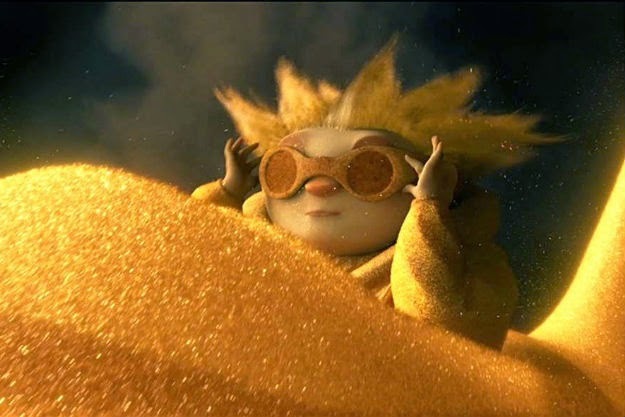 There are some odd scenes in "Rise of the Guardians"
Cinematographer Roger Deakins works here as a visual consultant, and he crafts a visual feast of blacks and golds that perfectly match the holiday spirit. Executive Producer Guillermo del Torro creates an entire fantasy world that has exquisite detail. The 3D animation works wonderfully, though it seems like a cross between animation and stop-action. 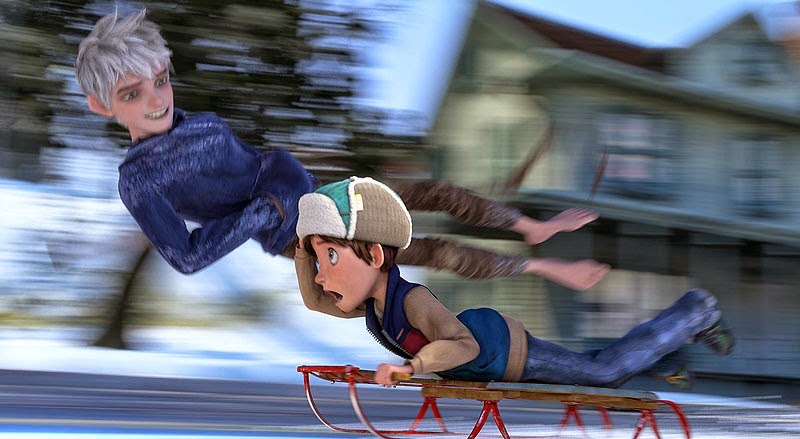 The latest animation techniques are used with a distinctive style that gives this film a unique look. To be sure, some might be put off a bit by some revisions. 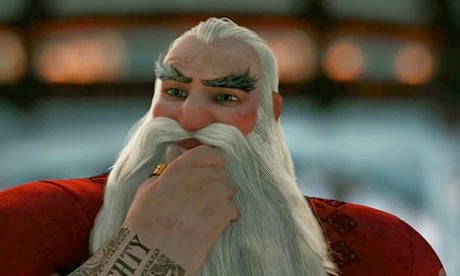 A Santa with tatoos is just kind of odd, and it really isn't clear what Pitch really wants other than to do away with the Guardians. Why do children have to believe in the Guardians in order for them to exist in the first place? The film relies on an extended conceit that kind of wears thin, and even children - maybe especially children - may have a lot of questions that are unanswerable. The elves, who traditionally are Santa's prime helpers, here are demoted to mere worker drones. The music by Alexandre Desplat is nice enough, if not very memorable. Screenwriter David Lindsay-Abaire ("Shrek") puts his own unique spin on the holiday season. For light-hearted family entertainment, the film is surprisingly dark (rated PG) and may give the youngest viewers a few good scares. 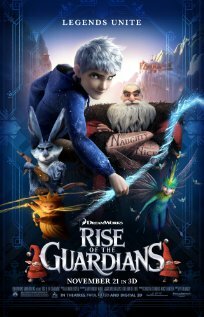 With a title like "Rise of the Guardians" instead of something like "The Guardians of Time," you just know that they are planning on turning this into a franchise. We'll see how the box office goes, but this seems more like a one-shot experiment along the lines of Tim Burton's "The Nightmare Before Christmas" or Bill Murray's "Scrooged." 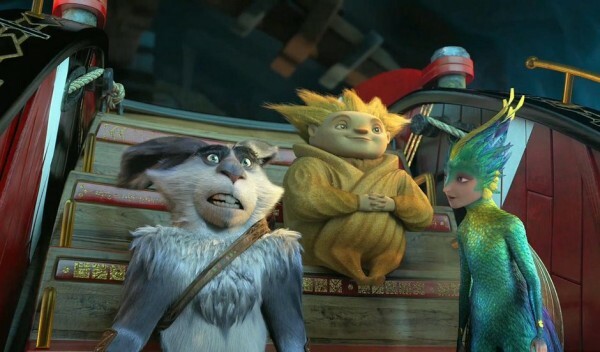 Dreamworks had to take a $87 million write-down on this film, which suggests there won't be any sequels, but one never knows until all the videos are sold. 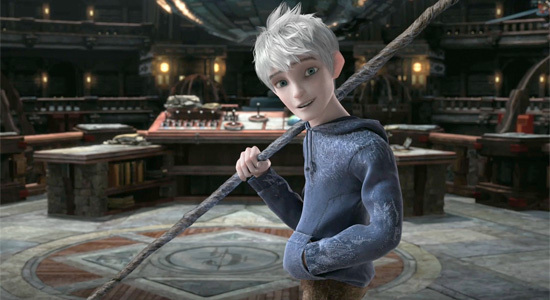 Overall, "Rise of the Guardians" is a bit convoluted and precious. It is difficult to see how you extend this sort of scenario into, say, the summer. Jack Frost may not have much to do around July 4th or Labor Day. That's a problem for the animation boys to figure out, if they have to. 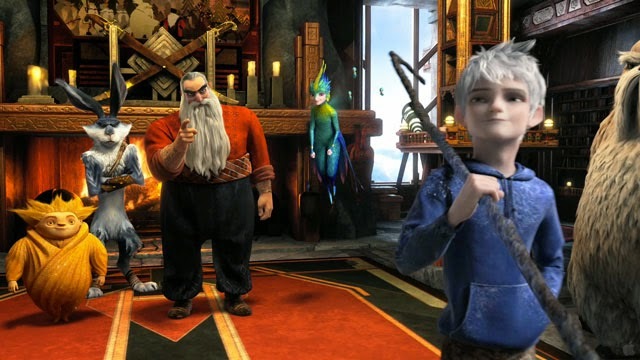 Sequels aside, "Rise of the Guardians" is not showing any signs of becoming a seasonal classic anyway. 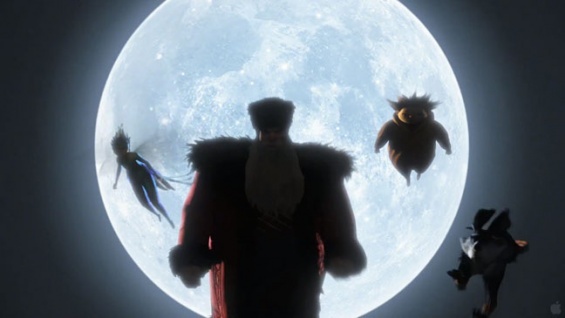 Regardless of popularity, many still may like that the morals of "Rise of the Guardians" are simple and clear-cut: everything is black and white, good versus evil, and light opposing dark. Good lessons for kids, and everyone else, for that matter. With those caveats, this is a good family film that pushes the boundaries of our childhood icons. If it is lucky, it could very well become a holiday staple for a new generation. But this film, by itself, is a lot of fun, and the animation is superb. Below is the trailer, with a link to purchase a copy if you would like below that.